Fujitsu's LifeBook A Series aims to provide a perfect balance between work and entertainment. To this end the LifeBook AH530 succeeds as a well built, if a rather unexciting, machine, with a decent range of features and excellent performance. 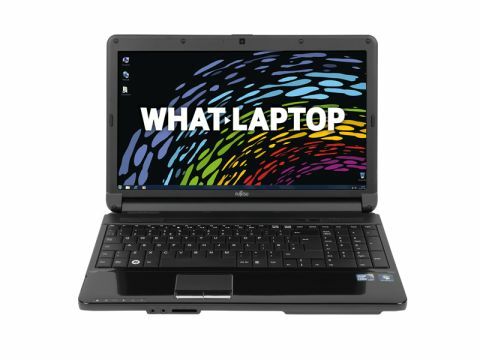 This laptop features an Intel Core i5 450M processor and all tasks were dispatched with ease, even when running several applications at once. Graphics are integrated, so multimedia performance lags behind the HP Pavilion dv6-3040sa and Medion Akoya P6512 with their dedicated graphics cards, but photo editing should prove no problem at all. Watching high-definition (HD) video and playing basic games are also within this laptop's capabilities. The 15.6-inch widescreen display is bright and just as sharp as other screens on laptops at this price point. Images are well reproduced, although some colours appear a little washed out when compared to the Asus' excellent screen. The chassis is a typical size and, at 2.5kg, is of average weight. However, the 172-minute battery life hampers portability. You'll need to pack the power charger on trips. Still, it's a firm chassis with a particularly solid lid, so can survive a few knocks on the road. The plain black design is very functional, especially compared to the likes of the Medion, but it's also good at hiding smudges and fingerprints. An almost comically tiny touchpad is in place, however, despite the wide palmrests, although it doesn't prove too irritating in practice as it's perfectly sensitive. The spill-resistant keyboard is firm and quiet, with flat keys that are comfortable to type on. There's also a numeric keypad in place, and only the arrow keys are cramped as a result. The Fujitsu has a number of great features in addition to the spill-resistant keyboard. An ExpressCard slot can be used to attach peripherals, along with the three USB ports. The 500GB hard drive provides a decent amount of storage, allowing lots of room for your media, and is backed by a 3-in-1 card reader. Networking is also as speedy as the majority of other laptops being released, and Bluetooth is also on board for quickly exchanging files with compatible devices or connecting a wireless headset. The LifeBook AH530 may not be a very exciting machine, but there is loads to like, from the excellent Intel Core performance to the great range of features. Portability is limited, but this laptop can still be taken on the road if needed.